We are located within the Porto Conte Nature Reserve, just a stone's throw from the Capo Caccia/Isola Piana Marine Protected Area, and just 9 km from Alghero Fertilia airport and the time-honoured centre of Alghero. Discover the wonderful paradise that plays host to our hotel! To re-charge your batteries more than ever before, we offer you accommodation options of various types, with views of the sea or the pine forest: classic rooms, superior rooms, family rooms and suite, all of which have been recently renovated and come complete with every imaginable comfort. We also offer a private beach, a panoramic swimming pool, a sailing schools, hire of vessels, electric bicycles and mountain bikes, massages and beauty treatments, fitness station, tennis court, free private parking, free Wi-Fi internet throughout the complex, and a panoramic restaurant. From June to September, the offering is enriched yet further by the free mini-club for our younger guests, evening entertainment, the aquagym and the bar/restaurant on the beach. Since 2005, we have been ISO 9001 certified for the Delivery of Quality Hotel and Catering Services. It gives us great pride to say that we have also been awarded the Environmental Quality Mark of the Network of Parks and Protected Areas and the TripAdvisors Ecoleader and Excellence Certificates. We want to guarantee you the best online rate. If, on the same day, you happen to find a lower rate with the same booking conditions, which we can check online, we will apply the lower rate to your stay, along with an additional benefit!! Discover our offers for your holiday. Why book directly via our website? By booking via www.hoteldeipini.it, you are guaranteed to get the best possible rates. If you find cheaper rates elsewhere, we will apply a further discount. (N.B. Tell us on which site you found a cheaper deal for the same dates, same type of room and same booking conditions, and we will offer you a lower rate. Please give us the link of the offer, which must still be valid at the time when we check it). Possibility to access special, exclusive packages and deals. Direct contact with our staff, thanks to which we can offer you enhanced services, tailored for your holiday, such as free early check-in (on request and depending on availability), luggage storage and a courtesy room for you to use straight away – these are just some of our most popular services! On our site, all transactions are protected by the most modern security systems for the processing of personal details. In addition, you will also have to option to book by credit card or bank transfer, eliminating all brokerage charges. Come and immerse yourself in the fantastic, magical atmosphere at Hotel dei Pini in Sardinia. 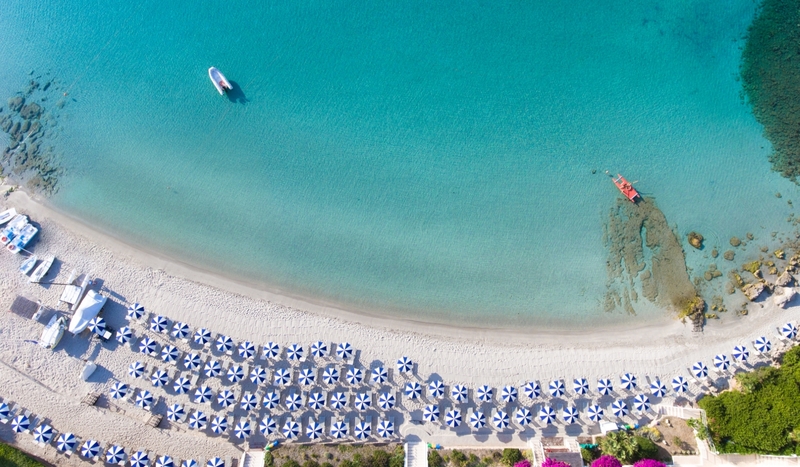 Our private beach, with ISO 13009 International Certification which certifies the quality of the bathing services. Just 12 steps and you are at our private beach! It is our pride and joy, and without doubt the space that our guests adore most of all. We are the first Hotel in Sardinia, and among the firsts in Italy, to receive the ISO 13009 International Certification which certifies the quality of the bathing services. Alghero is one of the most popular tourist resorts in northern Sardinia, and is known for the numerous Catalan influences that are evident in its cooking, its dialect and its architecture. We're here at Hotel dei Pini, in Alghero, on Sardinia, to make your mouth water. Let yourself be tempted by the mouthwatering flavours of Algherese, Sardinian and Italian cuisine, expertly matched with the island's finest wines.